Mediterraneo in Albert Park has been operating since 2002 but has come to the attention of a new market – coeliacs and gluten free diners – as they recently became the first restaurant to gain gluten free accreditation from Coeliac Australia. You can see the Channel 9 report on the gluten free launch here. 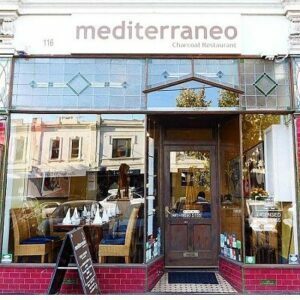 Mediterraneo has a cosy European restaurant feel downstairs, with a function room upstairs. Albert Park itself has a lovely village feel and is around 15 minutes from the Melbourne city centre by tram (number 12 or 96 from the Casino/Melbourne Exhibition Centre or number 1 from the Arts Centre). The bottom of the menu clearly states that all entrees and mains are gluten free. There are actually only three items that contain gluten in the kitchen, which is the complimentary bread, sponge fingers (for the tiramisu) and filo pastry (for the baklava) and these are all kept separately from the rest of the kitchen pantry. There is a vegetarian/vegan menu if you would prefer not to sort through all the meat dishes and if you are on a low FODMAP diet, just speak to wait staff to see what the best options are. 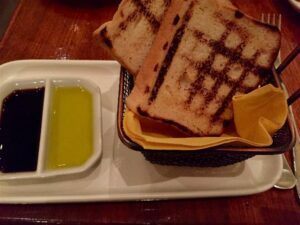 Gluten free bread is available on request ($2 ) and it comes with its own dipping dish. 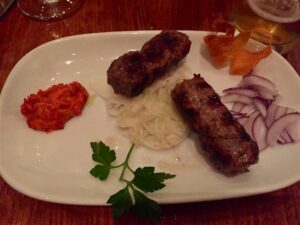 We shared the Cevapcici (skinless Wagyu beef sausages) entree and we both enjoyed the flavours of the sausage along with the condiments and it was a good size for sharing between two. 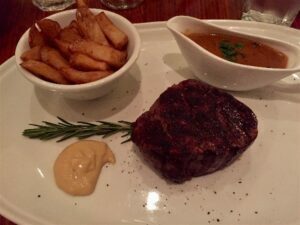 The steak dish was where the meal really shone – it was perfectly cooked and the chips were delicious. If you prefer, you can have roast potatoes instead of chips. I chose a side of brandy peppercorn sauce and also had some mustard just because I could! I love mustard but never normally bother in restaurants as trying to establish if it is a gluten free mustard just goes in the ‘too hard’ basket. 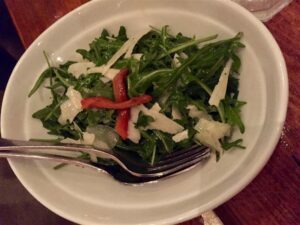 There are a number of sides to choose from and the pear and rocket salad complemented our meal nicely. All but two of the desserts available are gluten free and to my delight, crêpe suzette and sticky date pudding are both gluten free options. 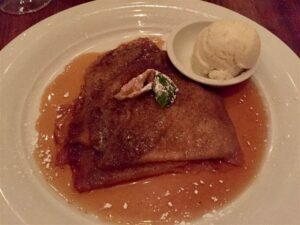 Crêpes are my favourite food, so I had to choose the crêpe suzette, but sticky date pudding comes a close second. My husband chose the sticky date and it was a rare treat to be able to taste his dessert. 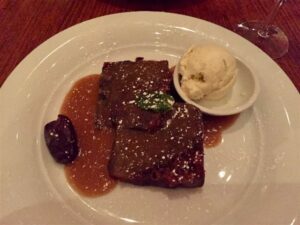 Both were amazing and I will definitely always be saving room for dessert at Mediterraneo! I couldn’t fault the service or the food, so I would highly recommend Mediterraneo for a special night out. The full menu is available on their website but to give you a guide, the average price for the mains is around $30 (my steak with sauce was $38.50) and the average price for desserts is around $14 (sticky date was $13.50 and crepes $20). The cost of a safe meal out for a coeliac, however, is priceless! Postscript: I loved it so much, our family celebrated Christmas Day at Mediterraneo.